Mexican police hunting the country's most-wanted serial killer have arrested a female wrestler. Juana Barraza, 48, was held as she allegedly fled the scene where a woman in her 80s had been strangled with a stethoscope, police said. 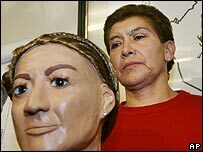 Ms Barraza, known in wrestling as the Silent Lady, is now feared to be Mexico's "Little Old Lady Killer". She reportedly admitted to Wednesday's killing, but denied a murder spree in which at least 30 women may have died. The killings began in the capital in the late 1990s. Mexico City prosecutors said fingerprint evidence linked Ms Barraza to at least 10 murders carried out in recent years. She was arrested at the scene of the killing of 82-year-old Ana Maria Reyes on Wednesday in the Venustiano Carranza area of the capital. After reports that a woman had carried out the killings, police suspected a man in woman's clothes. It meant months were spent detaining and questioning transvestites. But police said the broad-shouldered Ms Barraza resembled composite profiles of the suspect, and a wax mock-up, with a similar short reddish haircut and facial mole. They said they found in her possession of a stethoscope, social benefits papers and a social worker's identification card. Police have long suspected that the culprit got into victims' homes by pretending to be a government employee who could sign them up to welfare programmes.